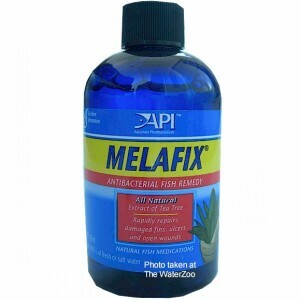 API Melafix heals open wounds & abrasions, treats fin and tail rot, eye cloud, mouth fungus and promotes regrowth of damaged fin rays & tissue. Will not adversely affect the biological filter, alter the pH, or discolour water. Safe for reef aquariums and live plants. For use in fresh or salt water. May overactivate protein skimmer in marine aquariums. Dosage 5ml per 38 litres (8.3 gallons), daily for 7 days.